I have strayed far away from my roots in poetry. Neglected the vague for the purely visceral. 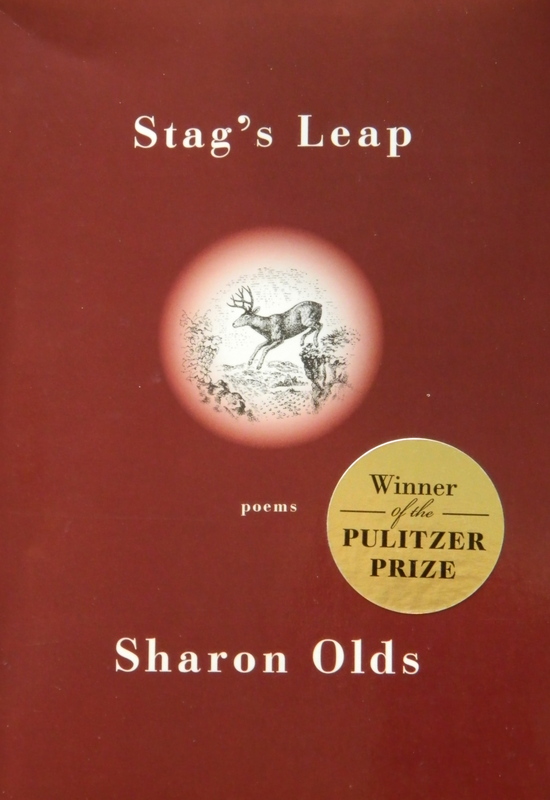 Yet there is nothing vague about the poems by Sharon Olds in Stag’s Leap, or any of her other previous works. I’m pleased that she won the Pulitzer Prize for this release. She truly deserves it. Stag’s Leap confronts the shreds of her life as she moves through the process of a divorce. Olds never hides behind her words. Instead, she uses them to strip herself bare to us. Embraced by her raw vulnerability, we find ourselves. We find parts that we didn’t know existed. She is teaching us our human condition. This is how poetry achieves relevance in a world that seeks to distract us from our inner core. I’ve heard that the most difficult aspect of divorce is losing two combined minds. My husband, Michael, is a natural people person. He’s taken over all the social aspects of our life that I tend to lack the energy for. At work, people naturally trust him, and he feels fulfilled by solving their problems and dealing with confrontation. As for me, this sort of work gives me a lot of anxiety. I run the internal workings – the daily chores at the building we run, the budget, the groceries, the smooth flow of our home, most of the cooking, and random work that provides extra income. While I work hard to write almost every morning, I spend the afternoons doing my share to contribute. Our balance doesn’t always work perfectly. There is often a lot of pressure for me to bring in more money, but I’m doing the best I can for now and trying to figure out how I can do better. Michael’s lack of balance comes from neglect around our apartment. He doesn’t realize that all of the piles of things he leaves undone end up being finished by me. Instead of contributing to my efforts, he multiplies the amount of cleaning that I do. Those small issues, however, rate low next to the chaos we experience without the other bridging the gaps. In marriage, a cocoon is woven. For years, we fought against it, held it back, and kept going out every night as though we were still single. Little by little, we began to find that the rest of the world really annoyed us. Why should we waste our time on excess baggage when our favorite person was right at home? Our social life went from quantity to quality. At first there was imbalance – spending a lot of time with people I didn’t choose, who didn’t choose me either – Michael’s friends. I appreciate our differences, but when I talk about the things I love, their eyes glaze over. It shifted when we began to cultivate friendships as a duo – finding people who enrich our interests and vice versa. Now I can appreciate all of the people in our lives because my needs are being met. I still look at my husband and think, ‘Who is this person that I’ve chosen to spend my life with, and how did this happen?’ It’s still a mystery to me. We are completely opposite and yet exactly the same – a complete contradiction. In the beginning I thought we’d never run out of things to talk about. That’s still true, as long as we keep living our separate lives, coming home with fresh energy to share. To be happy as a duo, you first have to be happy as a solo. Michael is certain that we will never get divorced. I say, that if we ever separate, there’s no point in getting a divorce, because I will never marry again. If that were ever to happen, I’d probably end up right back with him. His ridiculous quirks, daily dramas, sensitivity, and jokes – I’ve become so accustomed to all of him that I’ve forgotten what life looks like without his presence. There is the other running scenario, further in the future. The one where, being sixteen years older than I am, he passes away, and I’m a widow with a lot of life left to live. He’s certain that I’ll move to Paris, start smoking cigarettes, and surround myself with young protégés. I don’t know what I’ll do, but maybe I would move away. Even though Seattle is my home, there would be too many memories to live with. When someone dies, someone who feels like your right hand, you’ve got to find whatever method you can to not die right along with them. Some people think it’s romantic when a spouse dies a week after the loss of their partner. I personally, find that to be depressing and the sign of a life turned too far inward. The only way to move forward is to rebuild your life completely. I used to fear coming to this point in our relationship, when one of us has to say goodbye. I’m no longer afraid. I trust in my abilities of reinvention. I’ve spent enough time alone to know what it’s like, and I don’t really mind solitude. The thing that helped me let go of the fear was a documentary that follows several older women in London. Some of them have been without their partner for over twenty years. They haven’t succumbed to stereotypes of age, they’re not afraid of starting over, and they live passionate, exciting lives. Their style is a way of life. In short, they show us that growing old can be very beautiful, opening us up to new facets of life. Unfortunately, the full-length documentary has been removed, but here is a taster and a link to purchase the full-length film. We are lucky to find our best friends and lovers. Their presence makes pesky details less abrasive. They distract us with pure joy at having someone who really understands. They often present the challenge of ‘how do we grow with each other?’ The comfort of their arms is like a sedative, the struggle to retain the self, sometimes immense. Yet they are the only true source for our personal growth. Through them, we expand beyond ourselves. In our culture, we are taught to avoid grief, to pop a pill and be done with it. But you can never get to the happy well-balanced place unless you work through your full range of emotions. Masking a feeling only prolongs the ache. Separations, death – these are not experiences to be afraid of. They are a time to search the self, and begin again. As long as you are alive, there is time for new beginnings. Even at the point when you feel lucky to have made it this far. In fact, I feel that way already. As the years pass and Sharon Olds moves through the steps of letting go, we realize, her ex-husband remains mapped onto her body and through her mind. He no longer exists in the way he did before he left her. But his presence is permanent. Distant, but always a part of her – joined through their children and their thirty years together. Have you experienced the loss of a partner through separation or death? How did you cope, what did you learn in the process, and how did you come out on the other side? What was the positive that came out of the negative? Please share below. You are currently reading Letting Go at Lauren J. Barnhart.